Patrick Porter - "Reverb Saved My Life"
Patrick Porter is a Colorado based musician and writer who has also released a CD on Camera Obscura as part of the band Phineas Gage (now called The Wilhites). 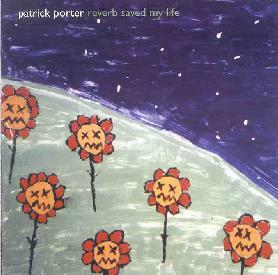 Reverb Saved My Life was originally recorded in 1996-97 when Porter was only 17 and released as a cassette entitled Lullabies For Bleeding. The music consists of folk-psych and pop songs with a drifting psychedelic sensibility. The promo sheet refers to a "Nick Drake-like internalization and soul", though while Porter may resemble Drake in spirit, the sound and feel of his music brings to mind bands like Spiritualized on the one hand, but also a bit of the classic 60's San Francisco psychedelic bands. The music is played at a measured floating pace, and while the guitars typically blend to create a quiet meditative environment, Porter can also rock out in acidic bliss, particularly on the excellent "Puppy Hill" and "Adopt A Highway/Tinsel". The dual guitars are simple but passionate, beautifully supporting Porter's poignant lyrics which reveal a great deal of inner reflection... no surprise given that Porter has published two collections of poetry. A very nice set that will appeal to fans of song oriented guitar driven psychedelia. You can email Patrick at: syrupbaby@hotmail.com. There's a very interesting and detailed interview with Patrick at Nick Bensen's Free City Media site at: http://www.freecitymedia.com/PatrickPorterText.html.